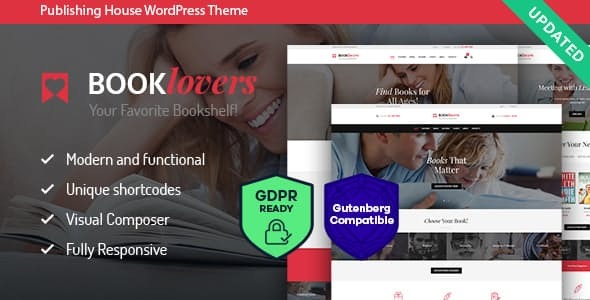 Booklovers – beautiful, fresh & clean Publishing House & Book Store WordPress Theme. It has modern and functional design built for Publishing House or Bookstore. The theme can be suitable for any Publishing service business or Book-Author official website. Also it can be interesting for Libraries, Literary Clubs, Digital and Media online stores. Booklovers is fully compatible with the latest version of WooCommerce to allow you selling your media products, like movies, audio, eBooks, video games and online course. Booklovers is fully responsive and Retina Ready theme, so it looks amazing on any platform. The theme is compatible with a bundle of premium plugins: WooCommerce, Revolution Slider, Essential Grid, WPBakery Page Builder and PO Composer to make it easy for you to setup and manage your publishing company website. With an intuitive visual interface, you can make as many layouts as you can imagine.